I've been swimming and coaching for many years and one thing that I see the most room for improvements, even in competitive swimmers, are butterfly and breaststroke turns. 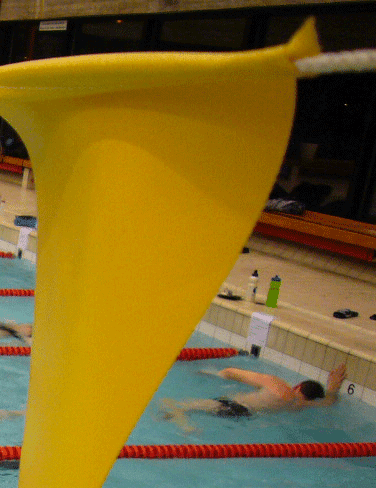 Let me give you a few tips and tricks on how to improve and speed up your butterfly or breaststroke turn. 1) Do not be lazy on your turns. This is a very simple rule. You shouldn't think of swimming walls as a place you hang out and rest. If this is your habit, I am sure you always see your opponent swimmers take off at the wall and then you play catch up the next 25 or 50m before another turn. If you need to rest, just do it in the middle of the pool, but not the walls. To speed up your turns, we'll use a simple visualization technique. Everytime you get ready to do a breaststroke or butterfly turn, pretend/imagine that the wall is a hot stove and if you let your hands rest there, they will get burned. This will help you to get off the wall quicker and you will not burn your hands twice:). 2) Know your body position when doing a breaststroke or butterfly turn. Some folks tend to touch the wall, then they lift themselves out of the water, using the pool wall as some sort of a box to push upon and then they fall back down and push off. Here, you need to think of yourself as a stationary object which does not move its axis. Once your hands touch the wall, tuck your legs under your body and push off. There is no reason for you to bop up and down during the turn. In other terms, you simple move your hands from the front to back and legs from back to front, sort of switching them around with the chest staying stationary at one place. 3) Definitely do not wait to move your legs until the bottoms of your hands (palms) touch the wall. The first thing that touches the wall during breaststroke and butterfly turn are the fingertips. Once this happens, the momentum will bring your palm to the wall, however, at the same time you should already move your legs forward and start driving your knees to the wall. 4) Finally, focus on switching the direction of your swim as fast as possible. To help you with that, once your hands touch the pool wall, you should right away spring your elbow in the direction you will swim now which is away from the wall and this will help you switch your legs with your arms on the wall. See the video for a great example. 5) Last, but not least, make sure you use your stomach muscles and your core body during the breaststroke or butterfly turn to quickly bring your legs to your chest and to the wall. To practice this, you can just lay face down into the water in the middle of the pool and just practice quickly switching your legs with your ams, so you always end up facing in the other direction. Some swimmers have experimented with butterfly flip turns, however, from my own experience, do not try it unless you are very very flexible at the shoulders as you might tear some ligament from the momentum and the surgery to get this fixed ain't pretty. Also, if you go this route, you might notice that you actually end up much closer to the wall then during a regular freestyle flipturn, because you actually have to touch the wall. This will cause you to spring much slower off the wall, but on the other hand, your push off is going to be very powerful.